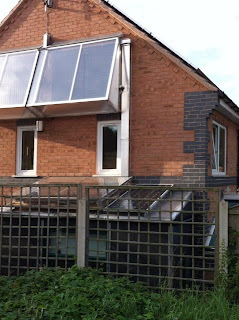 23 Aug 2013: The PV Panel for the house extension is now mounted and the DC cables are threaded through the vertical duct. It is not working yet because the regulator I got for it is not up to the job, and I should have realised this as it was a cheap Maplins one. This one is for a low powered device like a caravan solar panel or wind turbine. At the moment, it is 40v DC in, and 40vDC out.... should be 40vDc in and 12v DC out for the connection to the battery. Maplins also do a regulator for solar panels up to 500w. This panel is only 200W, so I now need another trip to them to get the more powerful one. Getting the PV panel ready to lift - it is only 15 kilos, so the biggest worry is how to avoid scratching the surface while handling it. The PV panel in place. Held down with only 3 clamps, I need one more M8 50mm bolt to hold down the fourth. The panel is delivering a healthy 40 volts plus, but I can see that there is room for improvement, already even though it is not connected. The photograph shows two shading hazards straight away. The solar-thermal panel next to it is 200mm higher so there is a shading hazard as soon as the sun moves to the West after 2pm. The garden fence is an open grid, but that is enough to cause a shading hazard in Winter. The roof angle is 15º, and the maximum winter sun angle is 15º the other way, so there isn't going to be much gain. With the shadow from the fence it will be even worse. However, I could build four aluminium legs and elevate the whole panel by 200mm. Another little building project on the way. It will also improve ventilation underneath the panel (marginal improvement in performance in hot air temperatures).